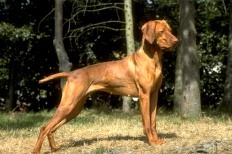 I am sometimes called the Hungarian Pointer or the Hungarian Vizsla. I am a sturdy, hardy gundog, having been used for many years in my native country as an effective retriever of waterfowl. I am mild-mannered, eager to learn, and easy to train. My coat is short, smooth and dense with no undercoat, but my cousin, the wirehaired Vizsla (Drotszoru Magyar Vizsla), has course and bristly hair. The wirehaired coat is only accepted in Canada. When fully grown, I am between 22 and 24 inches tall (55.9 to 61 centimeters) and I weigh between 49 and 65 pounds (22.1 to 29.3 kilograms). We have no Vizsla Breeders listed at this time. Click here to place your Vizsla Ad!